Quay Street by Róisín Cure. SKETCHING GROUPS are an increasingly popular way for amateur artists and people interested in drawing to meet and explore their shared love of paper, pen, and line. 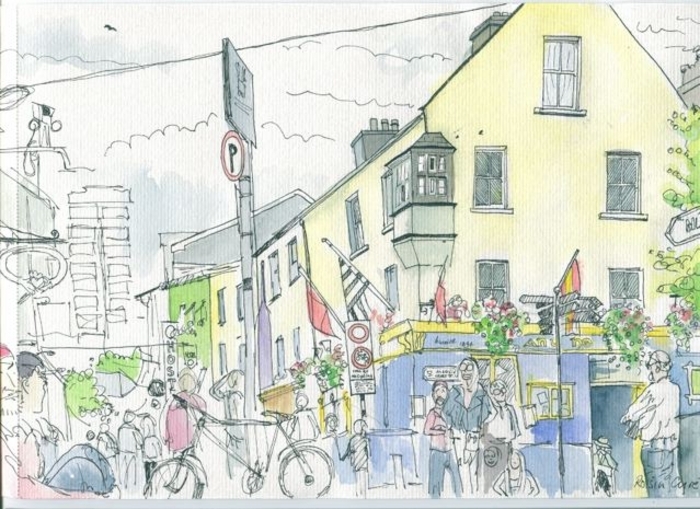 Galway is home to such groups and the newest is Urban Sketchers Galway, founded by Róisín Curé, Donal Fallon, and Jay Penn. The group meets monthly (the next meeting is 2pm on June 22 in Quay Street ), but people curious to find out more about the group, what it does, see examples of ‘urban sketching’, and how to get involved can go to a free talk taking place in Charlie Byrne’s Bookshop this evening at 6.30pm. Urban Sketchers Galway is affiliated with the main Urban Sketchers community, based in Seattle. Check out the Urban Sketchers’ blog.